A view of Leafy Hollow, Flint County. Seen in the distance is The Truth's farm. Leafy Hollow is a rural area in Flint County, San Andreas, housing only one building and a farm owned by The Truth. It is situated near The Farm, Back o Beyond, Flint Range, and Shady Creeks (Whetstone). Leafy Hollow is the ending point for the first mission for The Truth, who makes Carl steal a Combine Harvester from The Farm. After raising enough money to pay off Tenpenny's order of The Truth's crops, Carl returns to Leafy Hollow to pay him up. However, police arrived in a helicopter, attempting to make a bust on The Truth. The Truth has CJ burn down his farm's illegal crops with a Flamethrower and shoot down the helicopter with a Rocket Launcher. The farm remains abandoned by the end of the game. 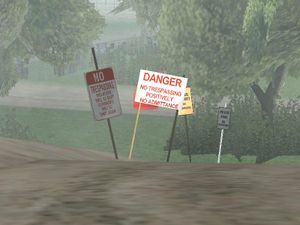 The dirt road leading up to the Truth's farm has several no trespassing signs, one saying "No Trespassing. Violators would be shot. Survivors would be shot again". However, there are no one to enforce them in the area. The Truth's illegal crops only appears during the mission Are You Going to San Fierro?. They do not appear outside that mission. This page was last modified on 15 March 2015, at 07:07.